This post inaugurates our Friday Fave blog series, featuring museum insiders taking a closer look at their favorite works of art. What is my favorite object in the Freer? That often depends on my mood. I have favorites within categories: favorite painting, favorite sculpture, favorite monster or god … I could go on. So, though I have been asked to talk about my favorite object, I am going to talk about the object I most want to touch, regardless of mood. In the back of the Freer’s gallery 18, there are two tigers made of bronze that peek out of their case, ready to be loved. Anthropomorphization? Absolutely. Every single time I see them. These two 3,000-year-old kitties call out to me whenever they catch my eye. Their fierce teeth, held up in a friendly, reserved expression, assure me that they would enjoy a bit of a scratch behind the ear or under the chin. I love these tigers because of the emotional tug they have on me. I am in awe that, thousands of years ago, an artist created these bronzes with such attention to detail, understanding of human and animal emotions, and love, that they continue to find admirers from near and far. 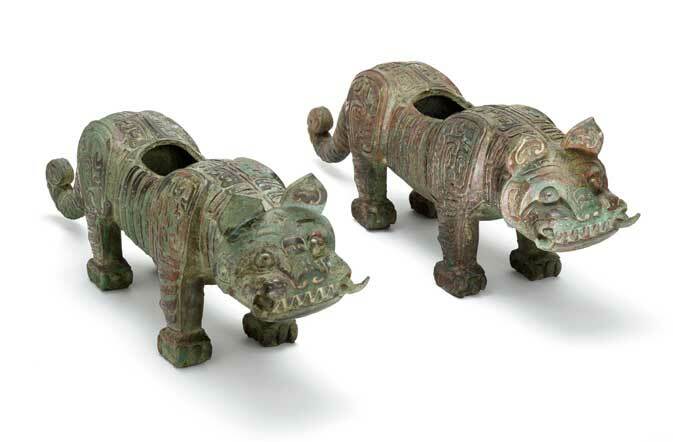 Learn more about ancient Chinese bronzes in the Freer|Sackler collections. Previous Post Previous Post: Digitocracy!